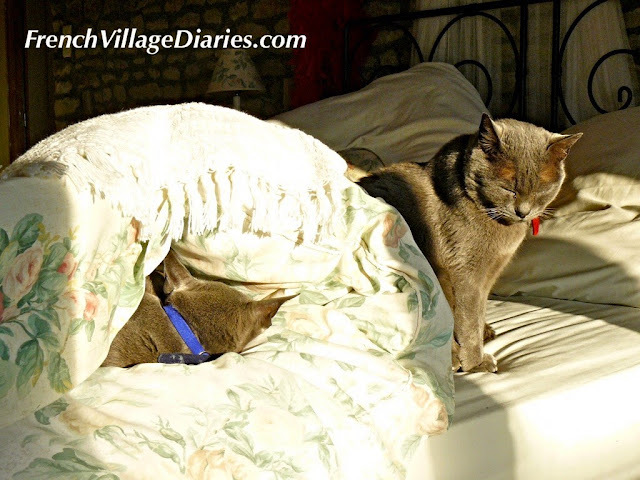 Despite the mildest November we have experienced (and this is our 11th) I have a feeling that our village has already entered into its period of winter hibernation. This is not my favourite time of year and the idea of hiding away until spring is very appealing however there is plenty going on in the run up to Christmas to keep me busy, but where is everyone else? I felt so sorry for him as all eyes were on him as we arrived and if looks could kill I may well have dropped dead as he walked into the salle des fêtes and had his choice of empty seats. It could have been a lively evening where ideas were discussed, taken note of and plans put into place. Instead, it was a little awkward until his ruffled feathers were smoothed with the Coke and apero nibbles that came out afterwards and he began to feel important rather than intimidated by the attention. Our Maire looked on the bright side; we had the youth development officer who presented the project the local town are planning and she was impressed that we are the only commune in the canton to start thinking about what we can do for our youth. But where were our youth? 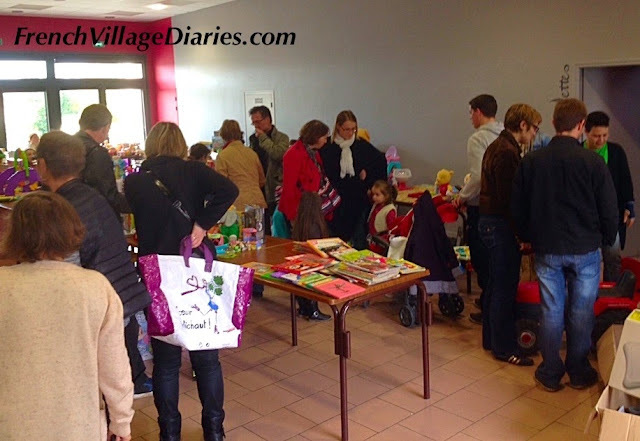 Last Sunday we held a successful bourse aux jouets (second hand toy sale) in the village salle des fêtes. I was very impressed with the number of good quality toys piled up on the tables, ready and waiting for their new families. 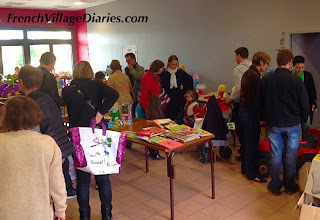 However, not one seller was a family from our village and although there were some local faces out searching for a bargain, most were from outside our commune, which I think was a shame. Where was everyone? We are usually busy at this time of year organising a charity meal for the first Friday of December as part of the nationwide Téléthon fundraising weekend. However at the meeting a few weeks ago to plan the details only eight people turned up and half of them were the four of us organising it! 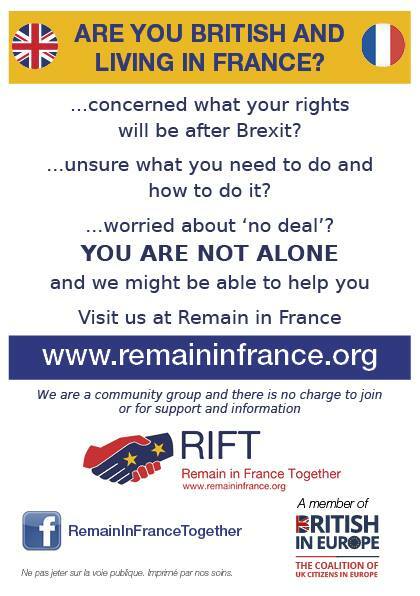 I was confident that we would be able to manage, as it is something we have done many times before, but the general opinion was that if no one could be bothered to come along to the meeting who would come along on the night. Costs would also be higher, meaning less money raised, as usually all the vegetables are donated by local farmers and potager growers, but with none of them at the meeting there were no guarantees of free produce this year. I know I’m not the only one who thinks it is a shame it isn’t going ahead. 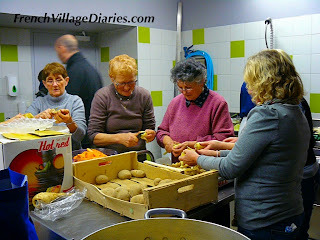 It has always been a lively, fun evening with a great atmosphere, but it needs the support of the villagers to make happen and at the moment it seems they’ve all gone into hibernation. Roll on spring.